Disclaimer: the PCBs pictured and discussed in this article were provided to me at no cost, in return for writing this review. I've received no other compensation and this is my own personal un-altered opinion. Recently I was contacted about a new PCB prototyping service called JLCPCB and asked to do a review. I've done a few of these over time, and this is much the same. 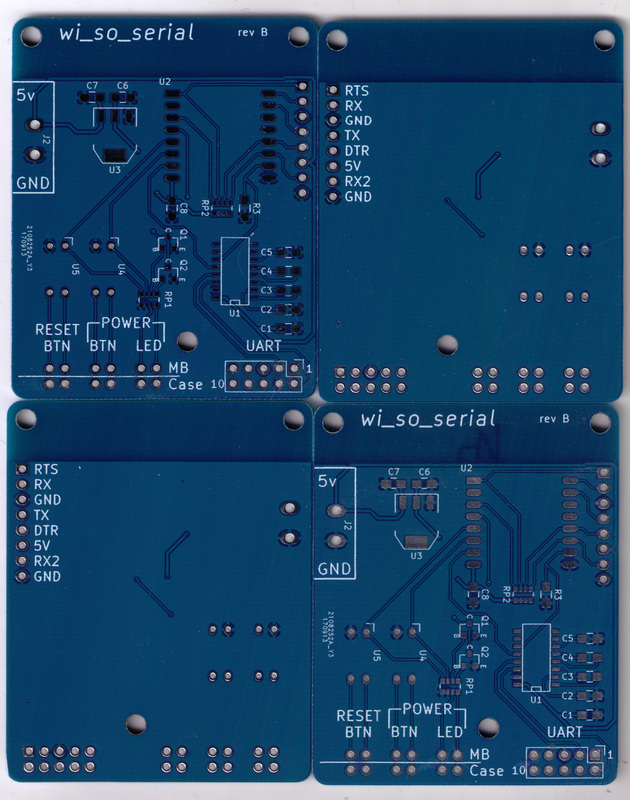 Pictured at left is four copies, two front and two back, of the board that I had made for this review. It's a simple board so I can't comment on high density pads, but all of the traces, holes, and solder mask appear to be well aligned. The silkscreen is solid and legible everywhere. Overall, I would say these are perfectly fine boards. I got ten copies, and they were all generally fine. Look (very) closely at the far bottom right of the image, though. You'll have to go full resolution to see it, but there's some scuffing around the pads near the bottom middle and bottom right. Cosmetic only, it seems, and the other nine boards had no issues or only even more minor scuffs/scrapes. 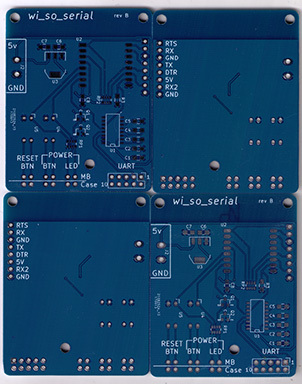 JLCPCB's claim to fame appears to be their $2 minimum cost. This applies only to the first board in any given order, and shipping from China applies to any order. So really you can get a few copies of one board made for $2, but you can only get it delivered for more like $12. Add a second board to the same order (e.g. to share the shipping overhead) and it will be $5. Just like EasyEDA, this is some sort of batching service, which adds customer numbers in the silkscreen. They do say this ahead of time, but as I've called out in earlier reviews, I really don't like it. Especially here. I explicitly put in the in the "remark" box that I'd prefer this number to be located under U2 or U1. It would fit in either place. But instead, it was put out near the edge in the most visible place. These are fine boards, there's (almost) nothing wrong with them. But if I'm going to pay a couple bucks for the boards, plus $10 to $15 for shipping, I'd rather go with Elecrow's "special" service, ten copies up to 10x10cm for $5 — with no extra customer number printed.